SESTA MARCONI from Italy have been brewing their doom'n'roll in voodoo cauldrons for a decade now, that's why their debut sounds so confident. Drawing influences from PENTAGRAM, BLACK SABBATH, CATHEDRAL or WITCHFINDER GENERAL, they blend them with their personal vision and serve us diverse, infectious and heavy traditional doom metal tunes, interlaced with a pinch of rock'n'roll and psychedelic passages. You won't sit still while listening to them, so grab your fave beverage or smoke and come, join the skeletons party! The idea of SESTA MARCONI dates back to 1999, when a group of 15 years old friends from the south of Italy set out their musical destiny. After the period of playing cover songs, in 2002 the band started creating their own music. By the end of the year they not only played live a lot, but also composed several songs, two of which ended up on their first demo, "Black Soul Star", falling stylistically between seventies hard rock and classic heavy metal with strong doom metal overtones. In September 2003 the combo relocated to Rome where they kept on playing, in spite of some problems that slowed them down for a few months. 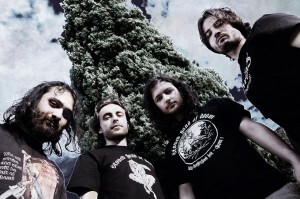 In 2004 SESTA MARCONI continued to forge new material, leaning more towards traditional doom metal. Most of those tracks went to constitute "Ritual Kamasutra Kitsch", a 30 minutes long EP released by the band in March 2008. In the 4 songs, preceded by the ironic audio-collage intro, the musicians summarized their personal exploration of the world from the last few years. The EP received some rave reviews from the metal press in Italy and abroad, praising the band for their superb musical and song-writing skills in the style blending traditional doom with the rock'n'roll influenced, catchy heavy metal passages and some psychedelic leanings. 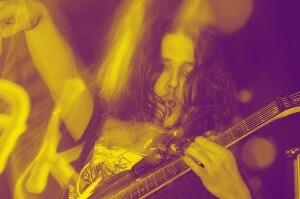 The band became quite active performing live and sharing the stage with their doom brethren from DOOMRAISER, MIDRYASI, SERPENTCULT, GODWATT REDEMPTION and many others. 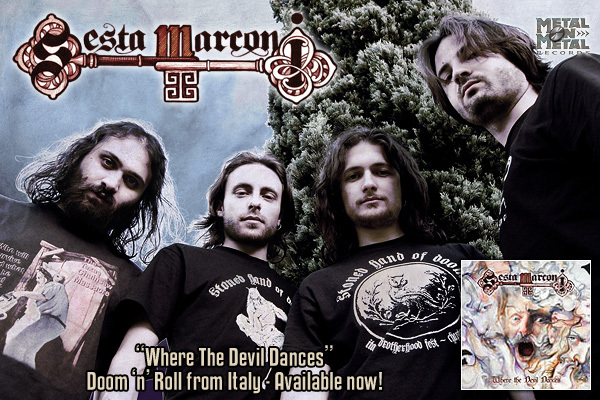 SESTA MARCONI was discovered and picked up by Metal On Metal Records in the beginning of 2009, to the great satisfaction of the band, that felt a fresh injection of energy and started working on what was to become their debut album "Where The Devil Dances", released in October 2009. SESTA MARCONI's brand of doom metal is definitely rooted in the genre's tradition from the '70s and '80s, but marked with the band's personal vision. They call it "doom'n'roll voodoo style"... What does it mean? Heavy and doomy songs with pulverising riffs, but definitely devoid of depressive, melancholic and ultra slow elements that characterize many other doom bands - instead with a pinch of rock'n'roll and psychedelic passages. Chances are you won't sit still while listening to "Where The Devil Dances", so grab your fave beverage or smoke and come, join the skeletons party!